With Unific, you can now connect as many shopping carts as you want to a one HubSpot portal. This video shows you how! We’re always trying to improve Unific so that it helps your business gain more insights and sales from your customers. Sometimes this features can add completely new dimensions to how you interact with your shoppers, and other times they’re just quality of life improvements designed to make everyday actions run more smoothly. With that in mind, we’ve recently added a feature that designed to help those of you with multiple shopping carts that differ by country, language, currency and/or brand. Previously, people with multiple shopping carts needed to have a unique Revenue Conduit (predecessor to Unific) account for each organization, which could be cumbersome and confusing. You gave us your feedback, and we listened. Today, you are able to use just ONE Unific account to connect any number of shopping accounts to HubSpot. Every store and every business can now funnel into one main account, giving you easier access to mountains of useful information with a few clicks, letting you easily jump back and forth across companies and storefronts. In Unific, go to connected accounts, then click on “add new account.” Insert your store’s unique URL and click “connect”. First, go into your store and create and order in the new shopping cart. This may involve creating a new customer in the “admin” section of your account if you’re using Shopify, Magento 2, or WooCommerce. Whatever system you’re using, go in and create a new customer and and order. After that, go into your HubSpot account and take a look at your Deals page. The order should already appear under “processed” with no wait time. If you click on “View Properties” for that order, and scroll down, you’ll find a “Store ID” box. It should have your store’s unique URL. If at any point you change your store’s url, this is where you must update it to keep your tracking. For now, jump back into the Ecommerce pipeline and click Add Filter. Use “contains” and then insert your store ID. Give it a name that you can easily recognize, as this will be how you separate your stores. After that, go back to all deals and open up another deal from a different store. Pull another store ID and create an additional filter with a different, easily recognizable name. Now when you come to deals, you can click on saved filters and to filter by your different storefronts. You can do this for different brands, different regions (UK/US) and more. Once you have this in place, managing multiple stores gets much easier, and you can do more useful things with this data. 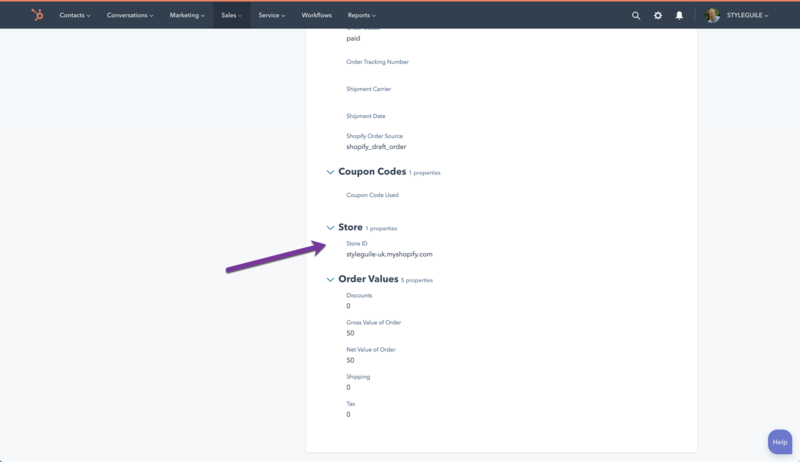 For example, if you have two different stores ( one for US and one for UK) you can start personalized workflows based on which store people came from, create new lists that compare products bought between the stores, etc. We hope that you see the exciting possibilities that come from having this data more readily accessible than it was previously. If you have any issues setting up this new feature, don’t hesitate to contact us.